As I was preparing this little essay about the origins and uses of mayonnaise, alarm bells went off in our newsroom. It seems that a load of boxes full of mayonnaise jars fell off the back of a truck on a highway in Japan. This incident (9/27/10 — I didn’t make this up) caused a pile-up involving several cars and a couple of motorcycles. Before long the condiment was spread all over the roadway, making it more slippery and dangerous than when it snows, according to one witness. No one was seriously injured, but the highway was closed for five hours. And, my goodness, what a waste of oil, egg yolks, and vinegar. The reason I happened to be thinking about mayonnaise in the first place was not quite that dramatic. Sally and I recently bought some pommes frites at a Belgian food stand, and the fries came with a dollop of mayonnaise, not catsup. I had forgotten that mayo is the preferred dip with fries in Belgium and the Netherlands, as well as parts of Oregon and Idaho. I have also read that it is used in Japan as a topping on pizza, so maybe that dumped load wasn’t such a waste after all. There are several theories about the origin of mayonnaise, but the prevailing one takes us to the Balearic Islands, off the coast of Spain. You may be familiar with Mallorca and Ibiza and Formentera as places to park your yacht, but perhaps you didn’t know that the main town on Menorca is called Mahon. It was at Mahon in 1756 that the French won a battle and snatched Menorca away from the British. Supposedly in celebration of that victory, the general’s chef whipped up a little something special — the recipe for the sauce was what we now call mayonnaise. Actually the locals, who speak Catalan, called it maonesa; the French frenchified it to mayonnaise. There’s another story that the name comes from an old French word for egg yolk, but I don’t see any harm in letting the little town of Mahon have some credit. The current residents make shoes and imitation jewelry for a living; they never cashed in on the tremendous demand for mayonnaise as an ingredient in tartar sauce and potato salad. 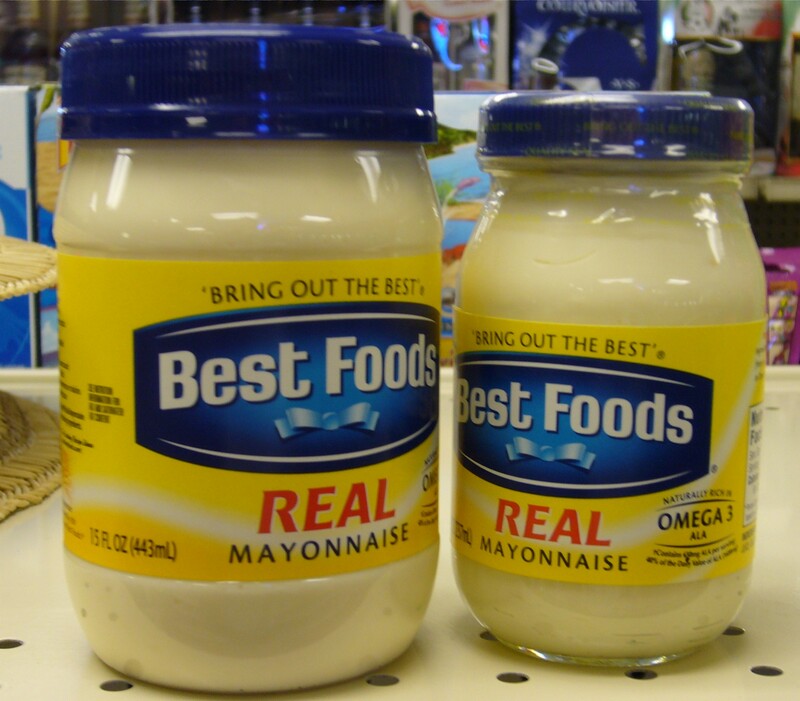 The first commercially prepared mayo in the U.S. was sold in 1905 at a delicatessen on Columbus Avenue in New York City. The deli was owned by a guy named Richard Hellman; his wife Nina was in the back room, making batches of the stuff. By the way, mayonnaise doesn’t have as much cholesterol as you might think — only 2% of your daily allotment in a single serving, which our government has determined is one tablespoon. Still, it might be wise to keep these precautions in mind: If you’re at a picnic and the mayo has been sitting in direct sunlight for several hours, it’s a good idea to just skip ahead to dessert. And if you’re on a highway behind a truck hauling mayonnaise, be prepared to hit your brakes and swerve out of its way. This entry was posted in Dining and tagged mayonnaise. Bookmark the permalink.